U.S. Sen. Susan Collins visits the Cianbro Corporation in Pittsfield, May 29, 2018. Collins said during a Sunday appearance on CBS' "Face the Nation" that the Trump administration's policy of pursuing criminal charges against immigrants and separating children from families along the southern border is "inconsistent with American values" and "traumatizing" to the children. U.S. Sen. Susan Collins on Sunday called the Trump administration’s “zero tolerance” policy of pressing criminal charges against immigrants and separating children from their families at the U.S.-Mexico border “inconsistent with American values” and “traumatizing” to children. U.S. Attorney General Jeff Sessions announced on April 6 that the Department of Homeland Security would refer all cases of illegal entry into the United States for criminal prosecution as part of the administration’s efforts to deter illegal immigration. The policy has resulted in a surge of children being separated from their families along the southern border. “To those who wish to challenge the Trump Administration’s commitment to public safety, national security, and the rule of law, I warn you: illegally entering this country will not be rewarded, but will instead be met with the full prosecutorial powers of the Department of Justice,” Sessions said in a statement announcing the policy. But Collins cast doubt about the efficacy of the policy as a deterrent against illegal immigration. Federal data show nearly 2,000 children have been separated from their families between April 19 and May 31, according to the Associated Press. The separations were not broken down by age, and they included separations for illegal entry, immigration violations or possible criminal conduct by the adult, the Associated Press reported. U.S. officials have suggested that this number will continue to rise, with the Border Patrol chief for the Rio Grande Valley, the busiest stretch of the Southwest border, estimating that the number of affected families could double, according to The Washington Post. During her Sunday appearance on “Face the Nation,” Collins suggested the number of children separated from their families at the border could exceed the nearly 2,000 reported by the Department of Homeland Security. On Saturday, Collins and U.S. Sen. Jeff Flake of Arizona sent a letter to Homeland Security requesting additional information about the separation of children at the border, citing cases of children being separated from their parents who sought asylum at ports of entry.
.@SenatorCollins said that the Trump administration's "zero tolerance" policy of prosecuting immigrants and separating families at the U.S-Mexico border is "traumatizing" children. Collins also called on her colleagues in Washington to take up legislation to address immigration reform and border security. A compromise immigration plan was presented last week by House Speaker Paul Ryan that has support from moderate Republicans but has faced backlash from conservatives. The proposal includes a path to citizenship for an estimated 1.8 million young immigrants in the country illegally, known as “Dreamers,” $25 billion for a wall along the U.S.-Mexico border and other security measures, according to the Associated Press. President Donald Trump is set to meet with House Republicans on Tuesday to discuss the bill, according to The Washington Post. The meeting that comes just days after Trump threw the fate of the compromise legislation into doubt when he said Friday he wouldn’t sign the compromise bill, but the White House later said he would sign the bill if it reached his desk. 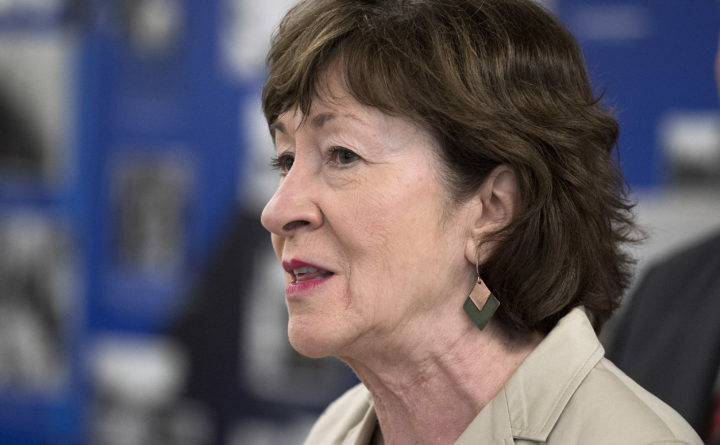 “We know from years of experience that we need to fix our immigration laws and that using children is not the answer,” Collins said.